When Ten Little Indians came out in 2004, Alexie did an interview with Wisconsin's Public Radio program "To the Best of our Knowledge." Click here to listen to it. Ten Little Indians is a terrific collection of short stories. The segment also includes an interview with Gayle Ross. She's a storyteller and writer. I really like her books. One is The Story of the Milky Way: A Cherokee Tale, which she did with Joseph Bruchac. Illustrations for that book are by Virginia A. Stroud. The beauty and importance of this book begins with Stroud's "Illustrator's Note" and Bruchac and Ross's "The Origin of the Story," both of which precede the story. 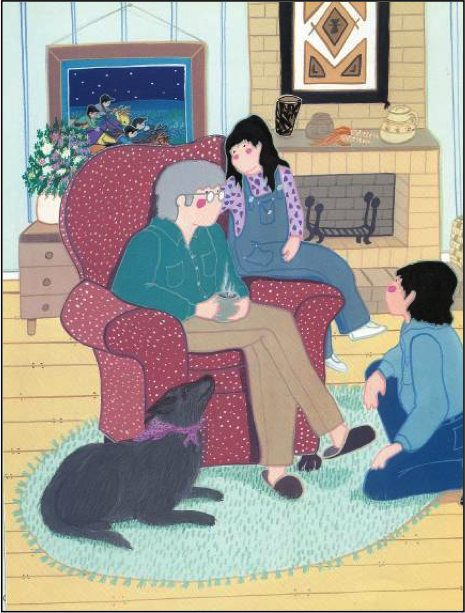 In these notes, readers learn how illustrators and writers can prepare their work in a way that conveys a fundamental respect for Native peoples, their histories, and their stories. See the family? They aren't in some fake tipi... They're in a living room, much like yours or mine, with a fireplace and a big comfy chair. This opening visually grounds the story and Native people in the present day. The first line is "This is what the old people told me when I was a child." None of that "many moons ago" or "in the days of the ancients" kind of prose that too many non-Native writers use! Note, too, that it is tribally specific, right up front in the title. It says "A Cherokee Tale." The closing page returns to the present day, with the grandparent and two children outside looking up at the stars of the Milky Way. This book is far better than Rodanas's Dragonfly's Tale, or Pollock's Turkey Girl. If you recently bought one of them, take it right back to the store and get your money back. Ask, instead, for The Story of the Milky Way. This is one you can count on. This is one of my favorite folktale books. As a public librarian in both Louisiana and Tennessee, I used it in storytimes and recommended it often. Your posting has made me realize that I do not have a copy in the school library where I now work. So I guess I know what I will be adding to my next book order. Thanks for reminding me of this favorite. Thank you so much for this post and for your whole blog! As the mother of a 5-year-old and a current student who will be teaching elementary school next year, I've been anxious to find culturally authentic Native American books for my daughters and for future students. I am not of Native descent and was raised on the (Euro)traditional misinformation available at the time; I'm as much fighting my own ignorance and misunderstanding as I am seeking to prevent the same for my children -- both at home and in the classroom. Thanks in large part to the Movie "Night at the Museum" and where we live in VA, my daughter has a fascination with Sacajawea and Pocahontas, and I'm struggling to find appropraite material to feed her interest without adding to the Disney-glurge already taken root in her imagination. Many thanks, again, for bringing your experience and insight to the web!